Ever since Postmates become the fastest way to send anything from point A to point B, the on-demand delivery app like Postmates, Jinn, and Quiqup has begun to grow with crazy pace. In one of our recent articles – The Best Go-To-Market Strategy To Build On Demand Services App For Multiple Industries And Make Millions! – we talked about how targeting multiple industries through an on-demand delivery app can get you ahead of competitors. In fact, Jinn is doing the same thing, by letting its users in Europe order anything locally for delivery – not just food. Founded in 2013, Jinn has successfully picked up $10 million in fundings recently, with the total funding of $20 million till now. The on-demand business and startup are currently handling deliveries by hiring freelance couriers and generating revenue through the £5.95 flat delivery fee plus charging 10% of the purchase. 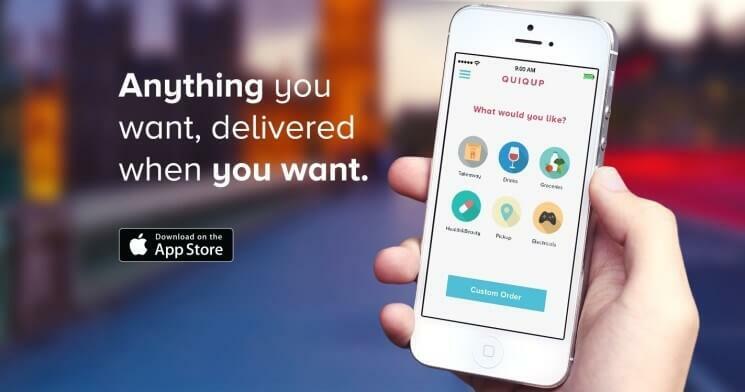 Similar to Jinn, another London-based on-demand delivery tracking app startup Quiqup has also raised £20 million in Series B funding. Originally, the aim of Quiqup was to let customers order anything from its app for local same-hour delivery, with initial emphasis on food. However, with new fundings, the startup says it plans to use the capital to expand to other U.K. cities beyond London and also start the international expansion. Another Malaysia based Food Delivery Startup – Dahmakan, has raised funding of $2.6M as it prepares to grow its business in Southeast Asia. The food delivery startup differentiates itself from the industry giants FoodPanda and Deliveroo with an end-to-end access to food, saying that it cooks all of the dishes by itself and delivers to its end customers. Moreover, Dahmakan also considers its food as healthy comparatively with junk food. 2017 was a tremendous year for the Malaysia based food startup as it boosted around $1.3M in Feb and also became the first Malaysian startup to be included as a part of YC’s summer 2017 program. Jessica Li – One of the co-founders of Dahmakan, revealed that the fund will be utilized for expanding technology and searching for new opportunities to grow the business into Southeast Asia region. The point of sharing this information is this: Today, time is a precious commodity for people. As customer expectations change, retailers of all sizes will be expected to offer flexible efficient and affordable delivery services. 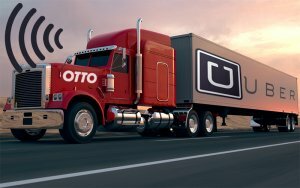 Therefore, creating a platform that let users order anything locally with a same-hour delivery guarantee with your on-demand delivery app can get you one step closer to launching a successful startup in the on-demand economy. If you’re still not convinced, take a look at UberRush, DoorDash, Deliveroo, and Stuart. All these startups are similar to Postmates, Jinn, and Quiqup, serving the same on-demand market. In fact, we have personally developed a similar app called Ninja Delivery. It is an on-demand delivery app, serving in California, to send any kind of packages from point A to point B. As you can see, there is clearly a need for these kinds of on-demand delivery apps, and food delivery startups like Postmates and UberRush are leading the industry at the moment. So, What exactly made them successful and popular? Or, What do these on-demand delivery app startups target? Originally, Postmates food delivery app started out as a food delivery app startup, similar to UberEats. But, Postmates has identified the opportunity and widened their reach by offering to deliver anything, not just food. In fact, Postmates today get some orders that are really small: a dishwasher liquid or a bar of soap. But, these small orders are what keeps Postmates running, as they guarantee a constant supply of orders for their couriers. 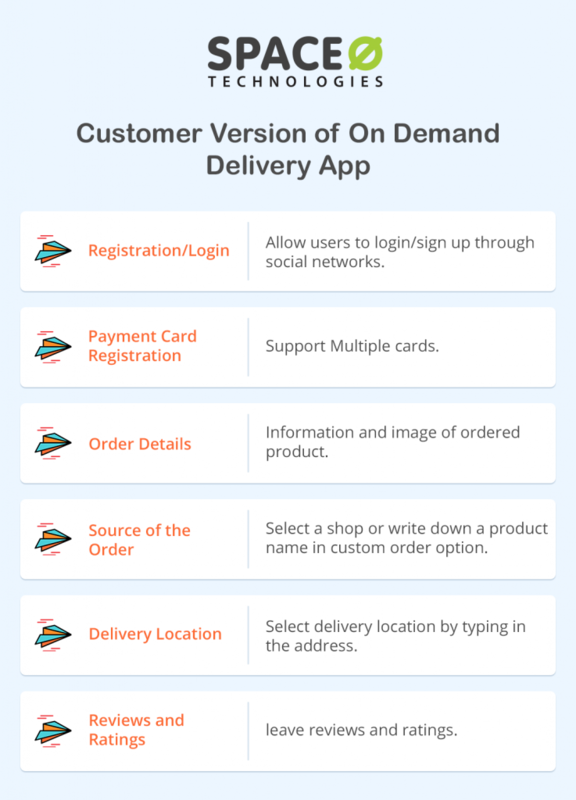 How to Get Started With Your On-Demand Delivery App? 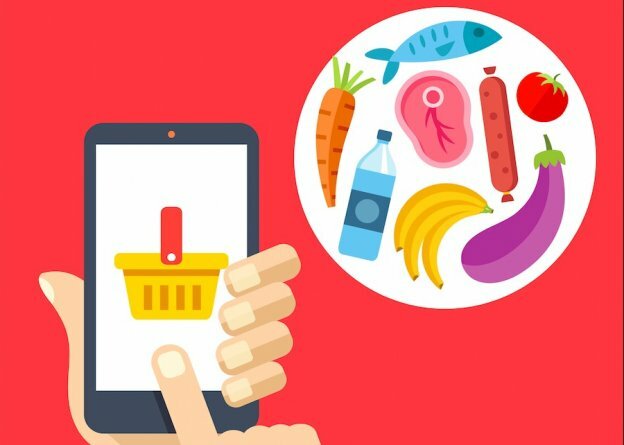 As mentioned earlier that time is the precious commodity for today’s consumers, you’ve to find and partner with local stores in your region to display products in your mobile app. For example, you’ll have to contact and make deals with restaurants, grocery stores, health & beauty businesses, cafes, etc in order to offer products in your app. On top of this, you must also provide an option to let customers write down their desired product, if it’s not available in the display, to order. There are two primary ways that on-demand business and startups find couriers. -They hire their own fleet of couriers. -They contract with freelancers the way Uber and Ninja Delivery does. The Uber-like method is much more common in most on-demand delivery startups, but depending on the size and location of the market, you’ve to decide this. However, when starting out, working with freelancers is cheaper for on-demand delivery startups. And, for any recently launched delivery startup, having their own fleet of couriers often seems like too much expense and commitment, but it’s recommended to hire a certain number of full-time couriers once the startup reaches a stable level of orders. The majority of on-demand delivery startups have separate apps for couriers/drivers and customers. We analyzed the most successful on-demand delivery startups on the market and created two templates that include essential features that a customer app and courier/driver app must have. In fact, when the client of Ninja Delivery App approached us, he also wanted to build just one app for both users, at first. But, after understanding the downsides of that, he agreed with us and decided to create separate app for both its users. 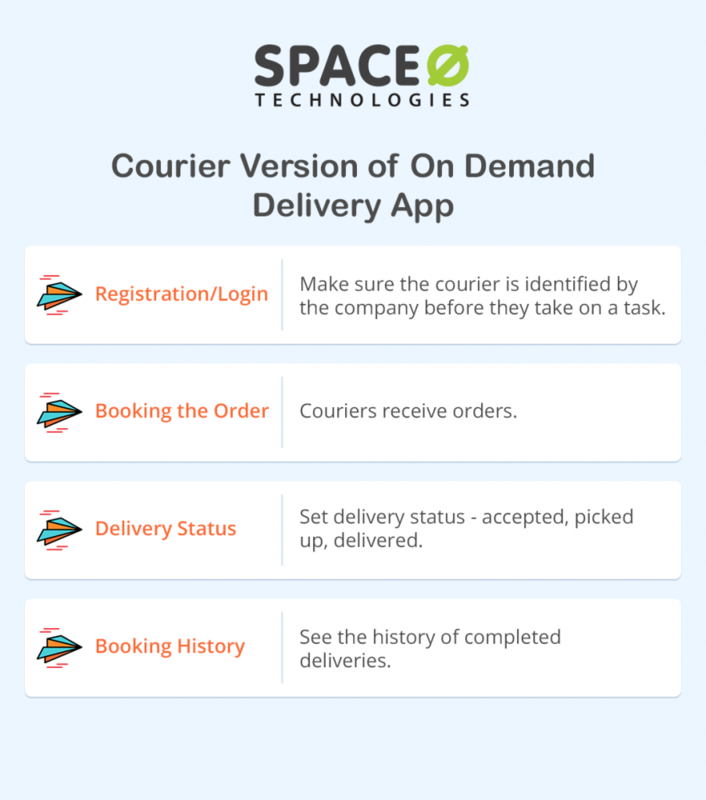 The courier/driver version of the app is simpler and only has a handful of only essential features. Now, of course, it will take time and effort, but focusing on the most essential features in your app will certainly put your app ahead of your competitors. 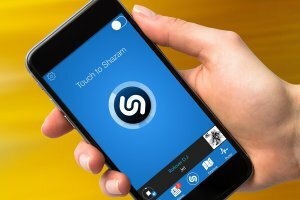 How Do On-Demand Apps Generate Revenue? Postmates does it in three ways: courier fee, retailer program, and convenience fee. Courier fee include a small reward for every order you make; convenience fee is extra price satisfied customers agree to pay (probably between 5-10% of the whole sum), and when it comes to retailer program, according to the agreement partners sign, they allow Postmates to take 15-30% of their revenue in return for noticeable placement in the app. Other on-demand app services generate revenue in a similar way. For newly launched on-demand startups, it’s best to charge 5% convenience fee and $5 courier fee that directly goes into the pocket of freelancers. Start by defining your target audience, then hire top mobile app development company to build your app around your target audience’s needs. Customize your services to meet the needs of a certain community, offering options that local businesses don’t provide. Invest in a good relationship with local stores and businesses. Don’t underestimate the power of word of mouth. Remember, building a reputation takes time and partnering with local businesses and stores will earn you the additional promotion for free. Hire full-time couriers on payroll once your startup reaches a stable level of daily orders. This will give you on-demand delivery business enough flexibility while optimizing your expenditures. So, if you are having an on-demand food delivery app idea, which you think that can grow your business, then you can cross-verify it with us as we are a leading mobile app development company and have already developed over 50 mobile apps on the on-demand solutions. In case, if you still have any query or confusion regarding on-demand food delivery app development, how much does it cost to create on-demand app development or on-demand delivery app for alcohol, then you can get in touch with through our contact us form. One of our sales representatives will revert to you as soon as possible. The consultation is absolutely free of cost! This page was last edited on March 1st, 2019, at 8:45. 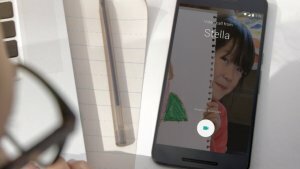 Have an Idea For On Demand Delivery App? Let's Discuss!